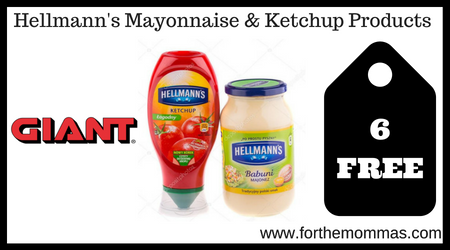 Giant: 6 FREE Hellmann’s Mayonnaise & Ketchup Products Starting 8/31! Starting 8/31, Giant will have Hellmann’s Mayonnaise for $2.99 each & Ketchup Products for $2.49 each. Stack a B1G1 Hellmann’s coupon with a couple of Ibotta rebates to further reduce the price. Plus score a $5.00 off instantly making the final price 6 FREE plus $4.04 moneymaker!